Bonn, 11 October 2018 - Bucking a major general trend, the overall status of waterbird populations listed on the African-Eurasian Migratory Waterbird Agreement (AEWA) has slightly improved over the last ten years, says a new report. 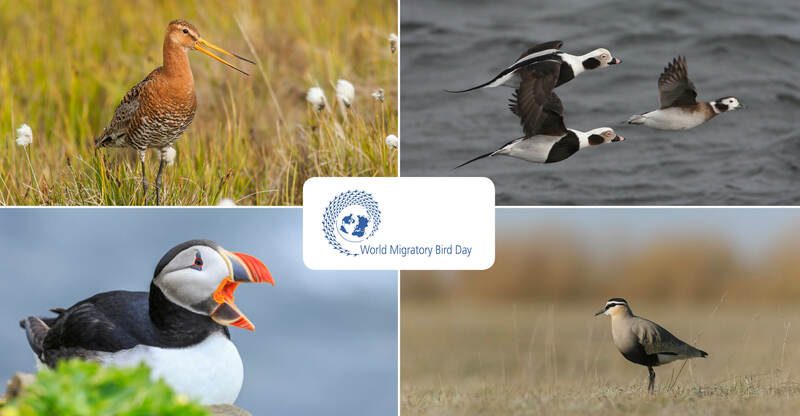 The findings are being released ahead of World Migratory Bird Day, an annual, UN-backed global awareness-raising and environmental education campaign focused on migratory birds and the need for international cooperation to conserve them. The 7th Edition of the AEWA Conservation Status Review of Migratory Waterbirds in the Agreement Area (CSR7) provides a long-term view of the changing status of migratory waterbird populations listed under AEWA. The upward trend assessed in the report is due to concerted conservation actions along the birds’ migration routes, the so-called flyways. These range from targeted species action planning for the most threatened species to ensuring that hunting of widespread waterbirds species is sustainable. AEWA protects nearly half a billion waterbirds and seabirds across the African-Eurasian Flyway. More than 220 species covered by AEWA have been assessed in the report. Currently more than 60 per cent of populations of the species covered by AEWA are stable or increasing. Pelicans, cormorants, avocets and stilts, flamingos and storks are the waterbird families with the highest proportion of increasing populations. However, crane and auk numbers are in strong decline. And the highest proportion of populations on the Endangered IUCN Red List are in Eastern and Southern Africa. Although AEWA is successful with recovery of threatened species, it is challenging for the treaty to stop the decline amongst the more common waterbirds as they are facing habitat degradation or reduction in at least some parts of their ranges. Climate change will affect hydrological regime of many wetlands which are also under human demographic pressure. Combating climate change and involving local communities are two main measures for stopping the decline of common species. Species are becoming globally threatened much faster than they can recover. It is a race against time. The situation is most dramatic for the birds that depend on farmed habitats – meadows and fields - and on the marine environment. Habitat loss and intensive agricultural practices are affecting farmland species. Drainage and overgrazing or the lack of grazing by livestock lead to degraded habitats for waterbirds. Examples of farmland birds affected are the Northern Lapwing, Eurasian Oystercatcher, Eurasian Curlew, Black-tailed Godwit and Sociable Lapwing in Eurasia, and Black Crowned, Grey Crowned and Blue Cranes in Africa. The status of seabirds is particularly worrying with the shortage of food due to overfishing, bycatch in fishing gear, climate change and pollution posing serious risks. Seabirds that are already threatened or near threatened are the Long-tailed Duck, Velvet Scoter, Common Eider, Razorbill, Atlantic Puffin, Black-legged Kittiwake and Yellow-billed Loon in Europe. Affected seabirds in Africa are the Cape Gannet, the African Penguin, Cape and Bank Cormorants and the Damara Tern. Both farmland birds and seabirds would benefit from conservation measures beyond protected areas. Conserving their habitats both at sites and in the wider landscape is necessary to keep common birds common. In addition, hunting must not threaten populations and other factors leading to unnecessary mortality must be reduced. The report recommends integrating bird conservation into a wide range of other land use policies. In the EU, action plans to preserve species and their habitats in agriculture and fisheries policies are efforts in this direction. The new Strategic Plan of AEWA includes measures to step up habitat conservation efforts. It will be presented for adoption at the AEWA Meeting of the Parties to be held 4 – 8 December in Durban, where AEWA countries will also agree on a response to the findings of the CSR report. The Strategic Plan will contribute not only to achieving AEWA's conservation targets but also to the UN Sustainable Development Goals and the Biodiversity Aichi Targets. Sustainable fisheries and agriculture are amongst the key prerequisite for species conservation. They are also enshrined in the UN Sustainable Development Goals. World Migratory Bird Day is celebrated each year to highlight the need for the conservation of migratory birds and their habitats. More than 650 events in more than 70 countries to mark World Migratory Bird Day 2018 (registered on the website) will include bird festivals, education programmes, media events, bird watching trips, presentations, film screenings and a benefit concert in Bologna to raise funds for international nature conservation. The Convention on Migratory Species (CMS) and the African-Eurasian Migratory Waterbird Agreement (AEWA) — two intergovernmental wildlife treaties administered by UN Environment — organize the campaign in cooperation with Environment for the Americas (EFTA). The Convention on the Conservation of Migratory Species of Wild Animals (also known as CMS or the “Bonn Convention” after the city in which it was signed) aims to conserve terrestrial, aquatic and avian migratory species throughout their range. It is an intergovernmental treaty, concluded under the aegis of the United Nations Environment Programme, concerned with the conservation of wildlife and habitats on a global scale. Since the Convention's entry into force in 1979, its membership has grown steadily to include 126 Parties from Africa, Central and South America, Asia, Europe and Oceania. CMS and its related agreements on migratory birds bring together governments and other stakeholders to coordinate and further develop conservation policies, to ensure that all flyways in the world benefit from coordination mechanisms that promote cooperation at ground level among the countries involved. For example, a special instrument for birds of prey (Raptors MOU) was established under CMS to address the variety of threats to these species. The Agreement on the Conservation of African-Eurasian Migratory Waterbirds (AEWA) is an intergovernmental treaty dedicated to the conservation of migratory waterbirds that migrate along the African-Eurasian Flyway. The Agreement covers 254 species of birds ecologically dependent on wetlands for at least part of their annual cycle. The treaty covers 119 Range States from Europe, parts of Asia and Canada, the Middle East and Africa. Currently 76 countries and the European Union (EU) have become a Contracting Party to AEWA (as of 1 November 2017).